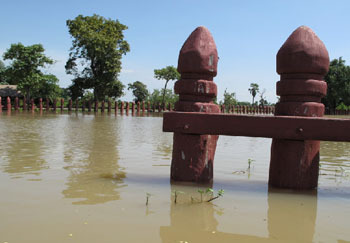 In 2010, the Royal Elephant Kraal in Ayutthaya suffered devastating impacts from flooding. Flooding meant evacuation for both people and elephants. The people who live and work with the elephants moved to wherever they needed to be to provide care.The cost for recovery was high and the work to rebuild was hard. On top of the damage from floodwaters, they had to turn away many visitors with the ElephantStay program, so it was devastating on all fronts. Asian Elephant Support collected donations to help the Kraal rebuild. 2011 was another devestating year. So many animals and people were affected (and too many died) throughout Thailand, and our friends at Elephantstay suffered substantial flood damage. The flood waters fully submerged ElephantStay and the Kraal for weeks on end. AES helped again with a fundraising campaign. In the midst of this disaster in 2010 was a reason for celebration. To the delight of many, a baby girl named Sai Chon was born to Pang Pootson. Fortunately, she was healthly and strong. Because the temporary field was not an good place for a baby, Sai Chon and her mom had to walk back to the historic Kraal where the other moms and babies were staying. The road was closed due to flooding, so they had to walk on their own, but with quite an entourage of mahouts and admirers who stopped often to make sure Sai Chon and mom got enough rest. To see more pictures please follow this link.